The Washington state clinic comments on a recent article that varicose and spider veins can be much more than a cosmetic issue. Varicose and spider veins are not just a appearance issue. While the problem of varicose and spider veins is widely known, there are a great many widely held misunderstandings about it among the general public. A June 26th article on Daily Mail is a first person account of one English woman’s experience with difficulties related to spider veins (often called “thread veins” in the U.K.). After receiving vein treatments prior to her marriage and the birth of her two children, she experienced some enlarged veins and some mysterious and odd sensations in her feet and ankles. She eventually found her way to a vascular surgeon who not only told her that she had a number of difficult to see varicose veins in her lower extremities, but warned her the she was a “leg ulcer waiting to happen.” She is now undergoing a series of what appear to be highly effective procedures on her legs. Washington state clinic Northwest Vein & Aesthetic Center notes that her experiences are far more common than most people would assume. The clinic notes that, while the problem of varicose and spider veins is widely known, there are a great many widely held misunderstandings about it among the general public. Most commonly, people believe that it’s an entirely cosmetic matter, but the reality is that varicose and spider veins can often be inherently painful. Worse, they can be associated not only with highly unpleasant leg ulcers caused by venous insufficiency, which can cause open wounds that can take a great deal of time and medical effort to heal properly. 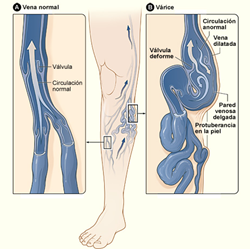 In some cases, there may also be relationship between varicose and spider veins and deep vein thrombosis (DVT), a serious type of blood clot which, in the worst cases, can travel upwards to major organs, with potentially deadly consequences. Northwest Vein & Aesthetic Center adds, however, that there are now a number of leading edge treatments patients that it’s two highly experienced vascular surgeons typically select, with older “vein stripping” procedures becoming increasingly rare. These minimally invasive procedures take advantage of medical technologies utilizing laser light, targeted radiofrequency energy, and ultrasound. The center adds that these techniques all offer outstanding results with brief recovery times, little discomfort, and few side effects. It adds that, very often, dealing with vein issues early is greatly preferable to dealing with more advanced vein related problems later on. Washington state area readers who think they may be dealing with vein-related health problems or other issues are invited to call Northwest Vein & Aesthetic Center at (253) 948-4378 to learn more about treatment at its Olympia and Gig Harbor facilities. They can also visit the center online at http://nwveins.com/. The center also offers a number of aesthetic treatments, including CoolSculpting and skin care.